The St. James Cathedral Racial Justice Dialogues is a five-week program for parishioners who desire to more deeply explore questions at the intersection of faith and racial justice. It started on Monday, January 21, 2019. Registration is now closed for this program. 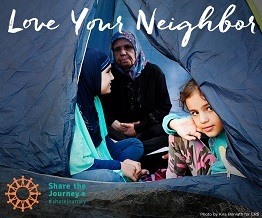 Pope Francis' 2-year global campaign to support our brothers and sisters who have fled their homes seeking a decent and safe life for their families. Participating organizations include the U.S. Conference of Catholic Bishops, Catholic Relief Services, Catholic Charities USA, and the Church’s global charitable network, Caritas Internationalis. Through prayers and acts of compassion and support, we will shape conversations and actions to answer the Gospel call to love our neighbors.